Â It’s always wonderful to discover hidden talents in people, and Riadh, who works in our Killarney shop, has really outdone himself in that regard. 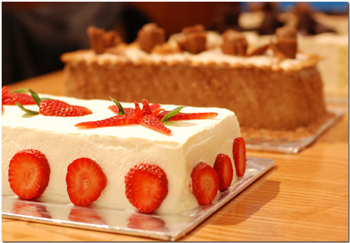 Yesterday, he presented me with these beautiful cakes he has been working on at home. 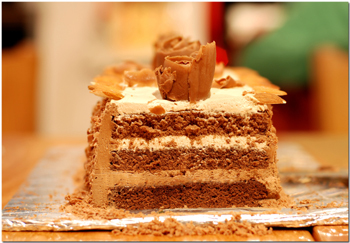 The presentation and care to detail is surely extraordinary for someone who doesn’t have a background in baking. I suppose it shouldn’t come as such a surprise, since he gives phenomenalÂ care and attentionÂ to making coffees, and he is one of the best baristas we have ever had. IÂ was a happy fork-wielder on this occasion, and we had a good tasting session. I’ll have to bring this man into the kitchen soon! 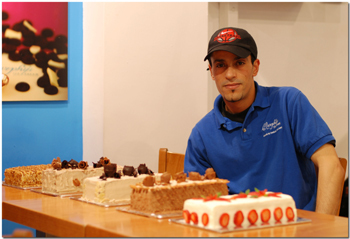 So, for my last post of 2006, I leave you with these cake photos and Riadh, because my brother and I certainly don’t exist in a vacuum here, and there are so many people who make Murphys Ice Cream possible. Thanks to all our dedicated staff and toÂ our customers and suppliers. I wish you all the best for a Happy New Year. 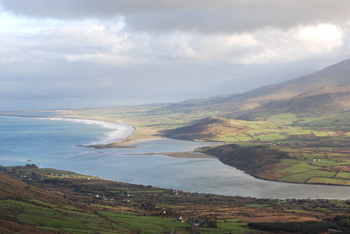 Athbhliain faoi Mhaise Daoibh! There are an infinite amount of things to add to brownies (I’ve already suggested Baileys), and today I had some left-over organic white chocolate, so I decided to cut it up and mix it in. 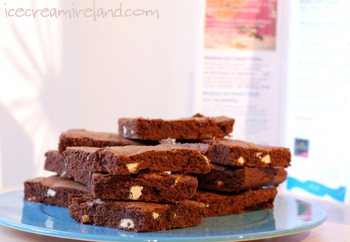 I used darker chocolate for the brownie base than our usual recipe to offset the sweetness. It worked out quite well, although I had the temperature of the oven a bit too high from my last baking session, and I over-baked them slightly. The head is still a bit fuzzy from the festivites! 2. Butter and flour an 10 inch square baking pan. Set it aside. 3. Melt the chocolate and butter in a double boiler. Mix until smooth. 4. Beat the sugar and eggs together. 6. Slowly pour in the chocolate and butter, mixing all the time. 7. Sift the flour, then add, mixing thoroughly. 8. Stir in the white chocolate chunks. 9. Pour the batter into the prepared pan, and bake 25 minutes (a knife should come out just about clean). 10. 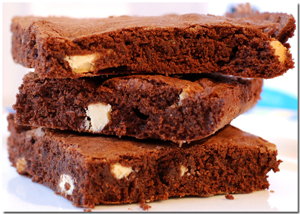 Allow the brownies to cool slightly. Then cut them into squares and transfer to a wire rack to cool completely. Note: If you’re in the UK or Ireland, please read my comments on flour, or you will be very disappointed with the results! 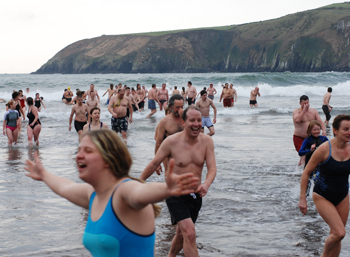 There are quite a few sore heads around the town of Dingle today after Lá an Dreoilín - Wren's day. This ancient tradition of music, costume, and merry-making is still alive and well on Stephen's Day in Dingle, and much fun was had by all. Thanks to my brother for the photos. I was busy playing whistle with the Sráid Eoin wren (John Street)! Happy Christmas, everybody. The photo was just in case you were wondering what an ice cream man does on Christmas day in Dingle (besides hang out with the family and eat). There was a huge crowd for the charity swim. Even my mother joined us in the December waterÂ – on the day after her 70th birthday! Â I haven’t really been ready and able for Christmas until today. 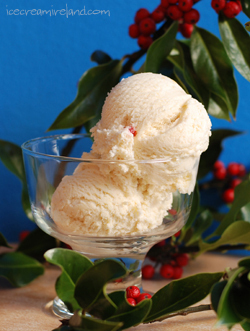 There are always so many last minute things to wrap upÂ before the holidaysÂ andÂ so much ice cream to deliver and re-deliver to shops. 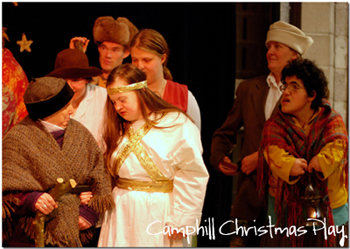 However, I took a bit of time this afternoon to see a Christmas play put on by the Dingle Camphill Community, and that brought out the Christmas spirit. 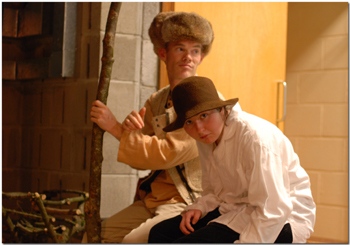 People with special needs can really open the heart, and such was the case with their performance. It was delightful. 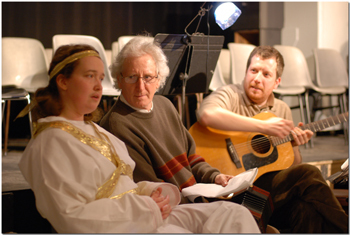 TheÂ play was a medieval pageant about the shepherds coming to the manger, and each special needs person had a minder to help them through the lines and around the stage. There was singing as well, and my brother and father helped with the music, my brother playing along on the guitar and my father on his concertina. Thanks to all for a lovely performance. I am in the mood now. Trifle, that favourite of Victorian times, is my father’s favourite dessert (he likes his booze-free), especially at Christmas. It actually existed earlier, and there is a reference to it in 1598 as “a kinde of clouted creame called a foole or a trifle in English.” It was the 18th century before biscuits or macaroons were added, and it took on the form we know today. (Day before) Cut the fruit in small pieces, combine with the brandy, cover, and soak over night. If you use fruit cocktail from a can, drain off all the liquid first. This part is important, or the fruit will become very icy in the ice cream. The absorbed alcohol will minimise the iciness. Combine the sponge or ladyfingers with the sherry. Stir until it is absorbed. Whip the cream until you have soft peaks. Do not over-whip! Fold in the custard, fruit, and sponge. Notes: 1. 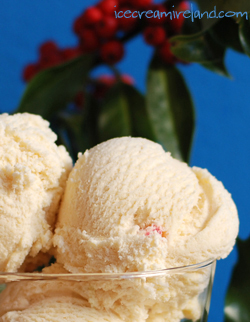 Because of the alcohol in this recipe, it will melt more quickly than normal ice cream. Â I’ve been a bit distracted here not only with the new camera, Christmas preparations, and planning for next year, but also with a project I have undertaken – scanning slides. 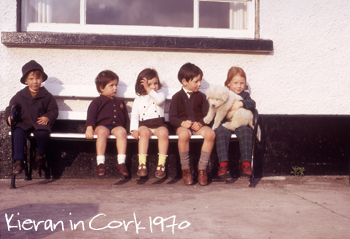 Most of our early childhood and family photos are in the form of slides rather than prints, and I figured it was definitely time to save and share them before they deteriorate further. So I borrowed a slide scanner and got to work. Hundreds of photos on CD will be aÂ good Christmas present for everybody in the family. 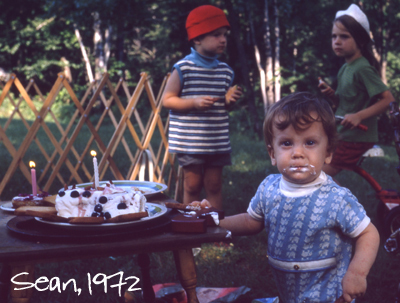 There are some beauties among them – above is my brother Sean on his first birthday, working on his sweet tooth in preparation for life as an ice cream man. Sadly, I still haven’t found one of me with ice cream! Â The legs of this ice cream man are a bit sore todayÂ after climbing Mt. Brandon yesterday. After weeks of rain, we had a little window of opportunity and grabbed it. Five of us went up at the behest of a friend whoÂ is heading off to Australia to get married. It was a sort of walking bachelor party, and what a place to do it. It’s a highly recommended climb on a clearÂ (or relatively clear day), and it took us about 4 1/2 hours. 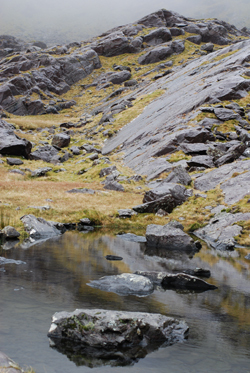 We took a taxi to the Brandon side, which is a prettier ascent and then descended on the Ballydavid side. Finally, we piled into a pub for some well-deserved pints. What a great day!